The news this summer has been dismal. Three-hundred-thousand fish dead in Mattox Creek off the Potomac River in July. Twenty thousand in Weems Creek in June. A six-mile-long algal bloom in the Potomac. We want to know more about what's going on in our rivers and Bay, and we need your help to do it. 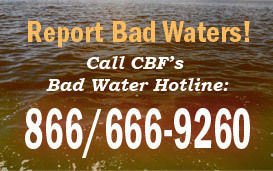 If you see or hear about something troubling on the water —like an algal bloom, fish kill, or "crab jubilee"—inform the proper authorities and call CBF'S Bad Water Strike Force Hotline at 1.866.666.9260. Where and when did the event happen? What did the water look like? Were there dead fish? If so, how many, what kind, big or small? Have you or can you take a picture of the event? Have you contacted the appropriate state agency? At the end of the summer, CBF will use your data to develop a report on bad water events in the region. We will share the report with government officials and urge them to support funding for Bay restoration. We'll also share the report with you.